If you speak an endangered language that is not included in the map, and would like to contribute to the Endangered Language Alliance's documentation project, please record a sample of yourself speaking and upload the video or audio here. The file must be an mp3, mp4, m4a, or mov, and the maximum file size is 75 MB. The two most useful speech samples are a Swadesh list and a story told from beginning to end. Please be sure to include your name, where you live now, and your family's history of migration (if relevant to your knowledge of the language you speak). In English the expression “s/he speaks with a forked tongue” is usually associated with the flickering forked tongues of snakes and snakelike beings, mythical tricksters and grifters and artists of temptation. In French, however, the expression “ma langue a fourché” - literally translated, “my tongue has forked” - is a pun that plays on the dual meanings of the word “langue” in French, which like the word for “tongue” in English and many other languages, is used to refer both to the tongue in your mouth and the language you speak with it. “Ma langue a fourché,” therefore, refers to a slip of the tongue, accidental and sometimes revelatory, where the langue bifurcates and you use one word in place of another. We all experience those slips from word to word within a language. But migrants and the multilingual are constantly speaking with forked tongues, slipping from one language to another: moving from living in one language, to living in another; or growing up in environments where tongues are constantly in motion, and nominally separate languages share space in the same sentences. Translators also speak with forked tongues: the Italian saying “traduttore, traditore" reminds us that the distance between translator and traitor can be very short, mostly because to translate always already involves some betrayal of the original language, some loss or omission or remaking. Every language contains untranslatable words, which are words that express a concept so effectively and economically in a particular language that they have no real equivalents in other languages. The classic example of an untranslatable word from a dying language, the Yahgan language of Tierra del Fuego, is mamihlapinatapai, which means ‘the look shared by two people when they both want to start something but neither knows how to begin.’ There is only one Yahgan speaker left in the world, so (despite its popularity on listicles of untranslatables) it is unlikely that mamihlapinatapai will ever be spoken in casual conversation again. When we lose a language, we lose an entire system of perceiving and describing the world. We lose the cultural identity and deep-rooted communities so often bound up with speaking that language. We lose the histories embedded in the particular vocabularies and development of languages, which can reveal where and when people lived, migrated, and traded. When languages die, those deaths are often not natural: the drastic decline in linguistic diversity on every continent parallels the drastic decline in biodiversity and is linked to genocides, civil wars, persecution of minorities, annexation of indigenous lands, and education policies that privilege colonial languages. Of the estimated 7,000 languages spoken in the world, hundreds have only a few speakers remaining, and many more will vanish before the end of the 21st century unless concerted efforts are made to reverse the trend. However, as in the garden of forking paths described by Jorge Luis Borges, the future is not yet certain (or rather: that future is only one of many possible futures that await us). In the present we still have the ability to preserve languages in danger of disappearing, by documenting the forked tongues of living speakers who can translate the endangered words into more commonly understood ones. Past documentation projects have been used to seed linguistic revivals in later generations, for example with Native Americans whose parents lost their languages when they were forcibly removed from their communities for schooling. Other languages have been transformed through educational activism - like Nahuatl, which is now being taught in Mexican schools - or changes in political status, like Berber, which shifted from a banned language of revolutionaries to an official state language of Morocco. The Endangered Language Alliance has taken advantage of the astonishing linguistic diversity of New York City, and in particular of Queens - ELA estimates that 800 languages are spoken across New York, with as many as 500 possibly spoken in Queens - to find and record living speakers of endangered languages without leaving the city, or even the borough. Based on data collected by ELA, as well as decades of linguistic research aggregated online by websites like Ethnologue and Omniglot, we determined that at least 59 endangered languages are currently being spoken in Queens. Each of the 59 polygons on the wall in The Garden of Forked Tongues represents one of those languages, which are rapidly or slowly disappearing from the world, but still being spoken in our remarkably polyglot borough. Their locations on the wall correspond to their distribution across different neighborhoods of Queens (fig. 1). 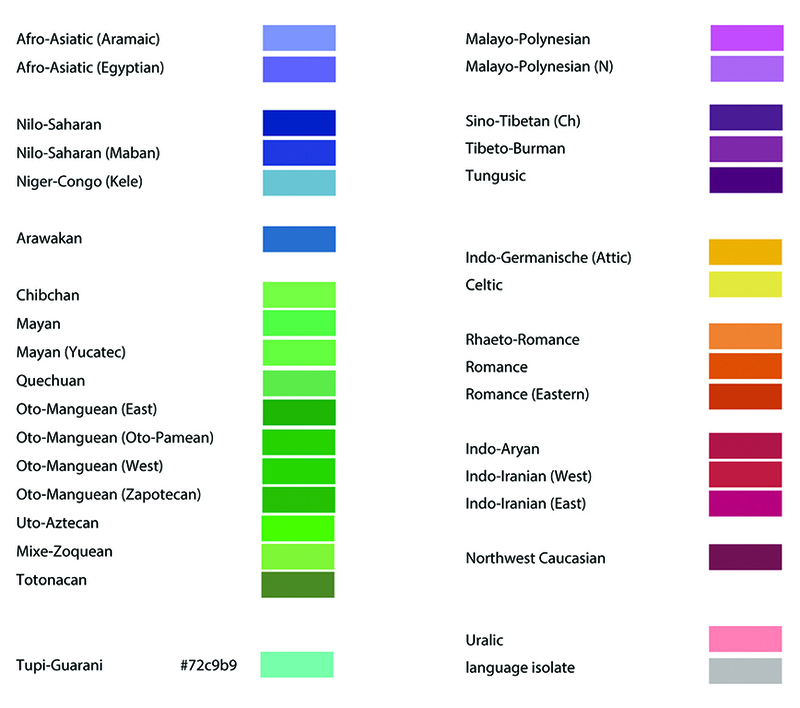 The colors are mapped to language families, and show the relationships between different languages (fig. 2). The size of each polygon is determined by three factors: the relative density of endangered languages spoken in that part of Queens; the natural logarithm of the number of living speakers of that language left in the world, which ranges from as few as 5 (Livonian) to almost 5 million (Guarani); and the Ethnologue scarcity rating, a scale from 1 to 10 (with 10 being extinct) which takes into account factors other than the number of speakers, such as whether a language is an official language or language of instruction, and whether it is being transmitted from generation to generation. 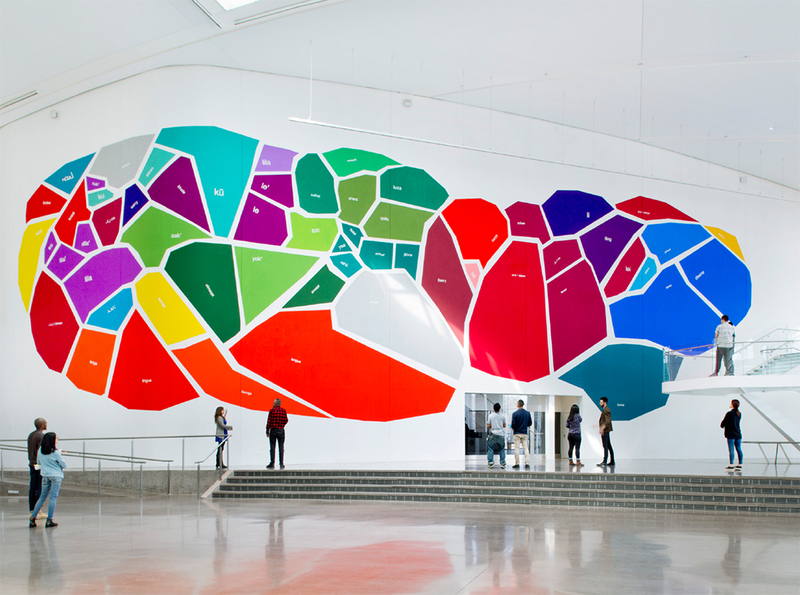 The data was visualized with both code (D3) and graphics software (Illustrator) to create a customized Voronoi tessellation, which was then hand-painted onto the wall with acrylic gouache. On the wall, the word that appears inside each polygon is the word for “tongue” in each language; you can use the interactive diagram here to decode each polygon into its constituent data. If you speak a language that may be endangered, and you don't see it here, that most likely means that ELA has not yet recorded a speaker of your language. Please come to a recording session this summer or submit a recording via this website, and join us in the garden of forked tongues.